When Chitty-Chitty-Bang-Bang took to the air, six year-old Gavin's eyes grew big as saucers. But, when the full-sized antique automobile swept out over the London Palladium audience, he nearly flew out of his seat. "How do they do that!?" I whispered loudly to be heard above the audience's audible buzz. "I don't know," he replied reverently, in awe of the miraculous machine. After three days of London's wonders on this kid-oriented visit - from animatronic dinosaurs and medieval towers to exploding piano sculptures and sushi served by conveyor belt - this grand finale was beyond imagining. I traveled to London with two writer/friends, Susan and Deborah, accompanied by their daughters Justine (7) and Cady (5), and our guide and leader Sharon with her two kids, Amanda (10) and Gavin (6). Lucky me. I functioned as kind of imitation grandparent. I could interact happily with the children but, when the inevitable jet-lagged fractiousness struck, back under a mom's wing they went. I netted all the fun, none of the grief. We began our English urban adventure at the Tower of London. You've got to love the Tower. It's filled with lore and romantically medieval mystery. I mean, how can any child resist a place filled with turreted towers, cobbled alleyways, winding stairways, lookouts and genuine castles where guards called Beefeaters dress in bright red and black? And, why wouldn't kids be intrigued by the notion of ravens kept in residence because legend says if the birds leave, England is doomed? To start, everyone wanted to see the Crown Jewels. Inside Jewel House, we followed a human river along a designated path that snaked through darkened rooms. A triptych screen showed films of Queen Elizabeth's inauguration (from when I was just a tyke), but the always-moving line prevented lingering. Still, the sparkling tiaras and crowns were dazzling, and many "oohs" and "aahhs" escaped from little mouths. It didn't take too much imagination to see yourself as a princess or prince, sitting high on a velvet throne wearing one of those crowns. 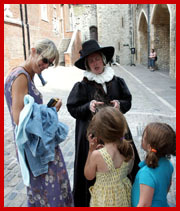 Leaving Jewel House, we encountered a Lady of the Court, dressed in full fifteenth century costume. "Look!" cried Justine, "A witch!" "Be careful with that word!" the lady, finger to lips, warned. "Edward is a Scot, and they're very funny when it comes to witches." Ghosts, she said, were a different matter. And did we know that a poltergeist purportedly lived in the tower behind us? And that the ghost was known to make people trip and fall down the stairs? Excited, we headed that way. Amanda, suddenly irrationally concerned about ghosts, refused to go in. Too bad. She missed some more good jewelry and crowns and nifty, spiral stone staircases. But, truth be told, any stumbling on those stairs would be about the precipitousness and tight spiral, not ghosts. We met those famous ravens towards our visit's end. They cawed loudly at Cady and Justine, raucously welcoming them to London. The Tower had been a good first activity choice, after the all- night flight. Active enough to keep the kids alert, but manageable enough to preserve their energy. We re-charged with a short late-afternoon rest, then off to a moveable feast. At Yo Sushi!, food circumnavigates the restaurant on a conveyor belt. Surprisingly to me, the kids ate well (especially noodle dishes). Maybe because they loved watching food like an electric train? This trip was well-planned. But, one element we couldn't have figured on - heat. Record temperatures were taking a toll: train tracks buckled; the gigantic London Eye Ferris wheel stopped running, cancelling our ride. London simply wasn't prepared for this kind of heat. Air-conditioning was mostly absent and, when present, it often wasn't powerful enough to matter. Which is why we ended up swimming in The Serpentine. No, we told Gavin (much to his disappointment), The Serpentine wasn't a dragon. It's the large lake that dominates Hyde Park. En route to our swim, we detoured to drive the pedlos - what we Yanks would call peddle boats. The New Zealanders who manned the pedlo operation insisted to us that the thermometer was topping 100 degrees Fahrenheit. Could it really be that hot? Certainly felt like it as we baked while we peddled across the water. Well, the heck with that. Let's get off the water and into it. We paid a few pounds to enter the swimming area. Given the weather, it was crowded, but wet was welcome. Before you could say "swimmers take your mark" the kids were in the water. Except Justine. Jet-lag and the heat caught up with her, and all she wanted to do was fuss. Ah, but a little gentle cajoling from her mom and Amanda lured her into the water and - like magic! - the cool liquid chilled her right out. Drying off, Susan magically produced a book, Katy at the Museum, set at the Natural History Museum - our next stop. She sat the kids on a shady bench and, over ice creams, read to them, previewing our next destination. Smart mom. She achieved quiet time in the middle of a bustling park. Caution! Dinosaurs Dining, Pianos Exploding! The imposing Natural History Museum building is faced in terra cotta done in the German Romanesque style. That's classic architecture combined with historically significant building materials. What did the kids see? A combination castle and palace. A huge dinosaur skeleton dominated the main entry hall - but we were after "live" dinosaurs. "T rex: The Killer Question" is an animatronic, all-too-lifelike exhibition focused on the question, "Was Tyrannosaurus rex a predator or a scavenger?" There were films to watch, displays to read, and more dinosaur skeletons to observe - but it was the life-sized, moving models that grabbed our attention. The animatronic scenes were graphic. I mean, one dino was eating another, complete with dripping blood and ominous roaring. For Justine, it was like watching a terrible accident - too gruesome to look, too horribly fascinating to turn away. Gavin, fascinated, couldn't get enough. Horrified or enthralled, we each stopped to vote on the thematic question? Scavenger, declared Amanda. Killer, Gavin held firmly. Both, said I. No matter how T rex obtained his food, we supped that evening on an English must-have - fish and chips. And, to get there, a London must-do - a double-decker bus ride. Our destination was Rock & Sole Plaice, the city's "oldest surviving chip shop," but determining the proper bus proved a challenge. After inquiring of several people - from the hotel concierge to some guy on the street - we boarded the wrong bus. Luckily, our mistake created an adventure that yielded a brief walking tour of the buzzing Covent Garden and Leicester Square areas. We ate alfresco and, even though the kids stuck mostly to chips, we declared the meal "genuinely Londonesque". Afterwards, responding to Cady's call for ice cream, we searched futilely for a scoop shop or something until, lost, we inadvertently wandered into an "adult entertainment" zone. A cab was quickly hailed and desert was obtained at our hotel - the Anthenaeum. Indulging in late-night ice cream, served in a private lounge? An excellent benefit of having upscale lodging. We split up for our final day. Moms and daughters went to see Princess Diana's gowns. Sharon and Gavin studied fish at the aquarium. Amanda, a budding writer and thespian, accompanied me, a former Off-Off-Broadway director - to Shakespeare's Globe. For anyone interested in theater history, a Globe visit is imperative. The tour was instructive, and we were lucky to see a rehearsal and sword fight practice, but two things stood out: the beauty and authenticity of the reconstruction; and the fascinating artifacts combined with interactive displays. I endlessly ogled details - the thatch roof; support posts honed by period tools. Amanda delighted in reading lines from Hamlet and Julius Caesar with a computerized co-actor. 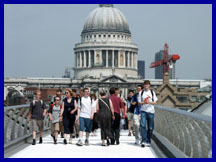 We were obliged as responsible tourists, I told Amanda, to walk on the Millennium Bridge, after which we met the others at the Tate Modern for lunch. Everyone rated the museum building - a converted power station - as cool, but when we encountered "Concert for Anarchy," the cool factor literally exploded. The sculpture, a grand piano hanging in mid-air created by artist Rebecca Horn, literally burst apart every few minutes, then slowly reassembled itself. We finished our visit with high tea at the hotel followed by Chitty Chitty Bang Bang, playing at the famous London Palladium. I was initially cynical. How many times had everyone seen the film? But, when that car flew out over the audience, my eyes popped just as wide as Gavin's. This was special. A perfect grand finale to our taste of London - crowned with a quick stop, en route to the airport, at a Paddington Station gift shop to buy - what else? - a Paddington Bear. Visit Britain (British Tourist Authority), 551 Fifth Avenue, Suite 701, New York, NY 10176-0799; 212-986-2266 or 1- 800-GO-2-BRITAIN; www.travelbritain.org. 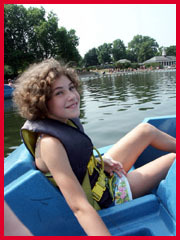 An indispensable guidebook: "Time Out London for Children", visit www.timeout.com. Flights: London is served by most major airlines. We flew on Virgin Atlantic, which provides an excellent kids' amenity pack, a kids' menu and, on most planes, offers kids' entertainment channels aimed at specific ages. 1-800-862- 8621 or www.virgin-atlantic.com. Lodging: For general info, visit the above-mentioned websites. We lodged at The Anthenaeum Hotel & Apartments on Piccadilly, conveniently located adjacent to Hyde, Green and St. James Parks; kids get a welcome nylon rucksack with a teddy bear, photo album, toiletries, etc. ; 1-800-335-3300 or www.athenaeumhotel.com.